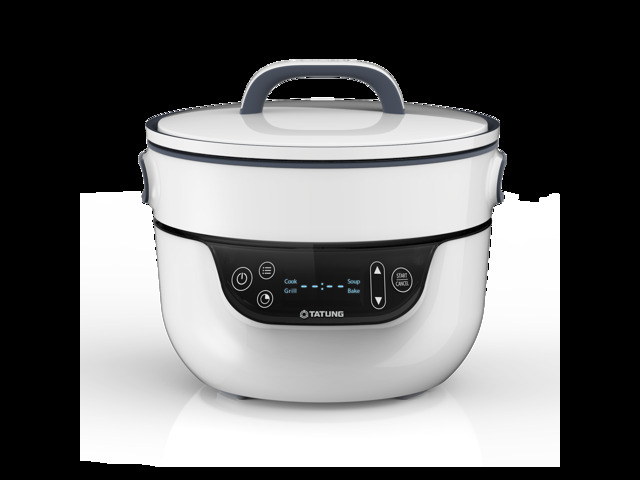 Cook your food without using "Water"
The Tatung Fusion Cooker combines a skillet and a waterless pot into one appliance. 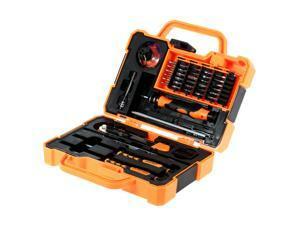 It allows individuals to prepare complete meals with a minimum of equipment and effort. Non-Stick Grill Pan. You can steam and grill to perfection. Non-Stick Waterless Pot. Cook your food without using "Water". Natural juices of the food are used when cooking with a waterless pot. 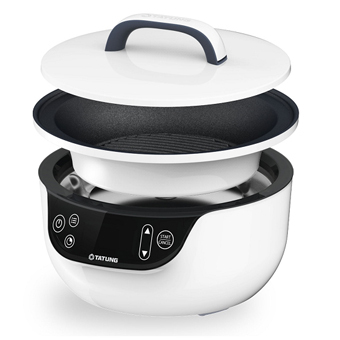 A three-liter waterless pot cooks food without the use of additional water; natural juices from the cooking foods steam heating. A nine inch skillet allows for frying, grilling, sautéing and more. 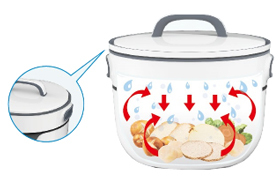 An airtight lid fits tightly, helping to trap moisture that cooks the foods more quickly. 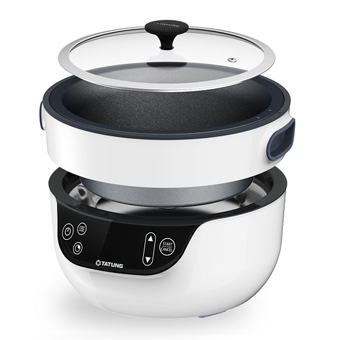 An additional glass lid provided with the cooker allows the user to keep an eye on foods cooking when using the waterless pot; perfect for making shabu shabu/hot pot. 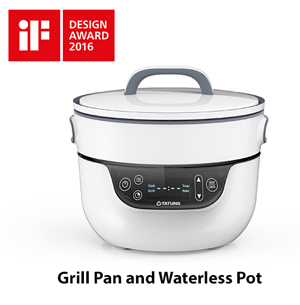 Both the pot and grill are lined with an advanced non-stick coating to prevent foods from sticking to the surfaces as they cook. 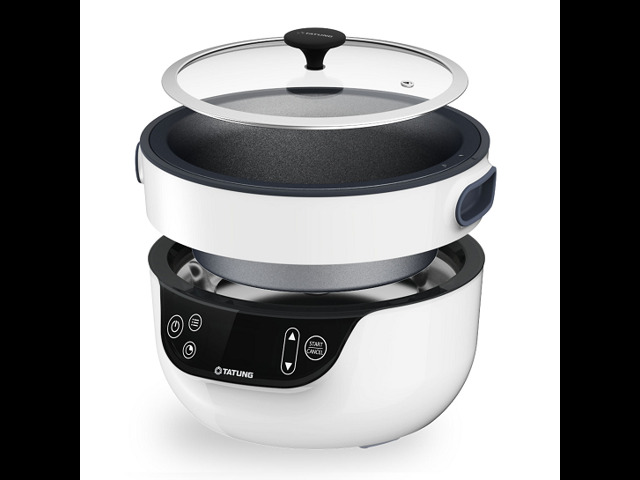 An added benefit of the Fusion Cooker is that it is energy-efficient and takes up very little counter space when in use. Easy user controls and built-in safety features will make it a great addition to the home kitchen. 4 cooking preset: Cook, Grill, Soup, Bake. High grilling ridges for perfect grilling and allow fat to drain. Metal lid for waterless cooking. Glass lid allows you to watch your food while cooking. Thanks to the "Power Seal" design of the metal lid that eliminates water loss. 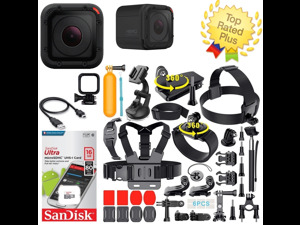 "Power Seal" design locks in moisture. Clear visualization of your cooking process. Waterless cooking, Perfect for soup, heating, and baking. 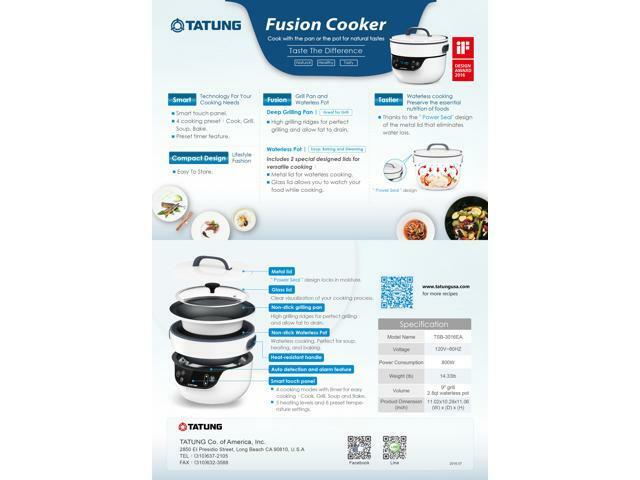 Features The Tatung Fusion Cooker combines a skillet and a waterless pot into one appliance. It allows individuals to prepare complete meals with a minimum of equipment and effort. 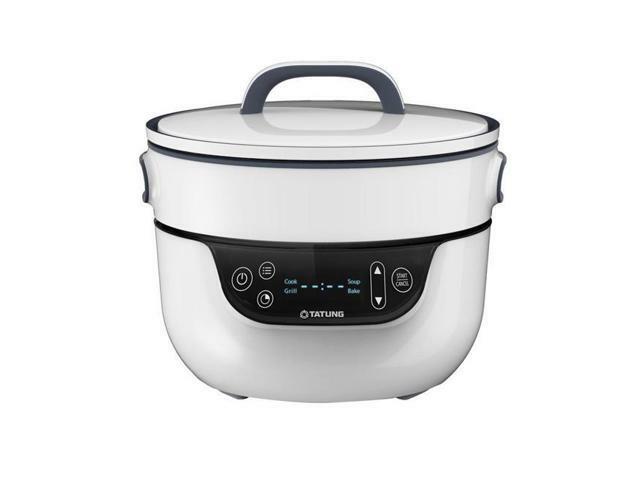 A three-liter waterless pot cooks food without the use of additional water; natural juices from the cooking foods steam heating. A nine inch skillet allows for frying, grilling, sautéing and more. An airtight lid fits tightly, helping to trap moisture that cooks the foods more quickly. 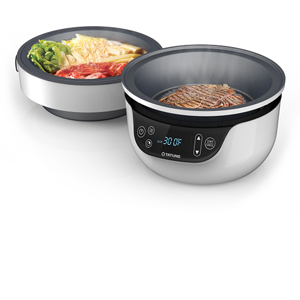 An additional glass lid provided with the cooker allows the user to keep an eye on foods cooking when using the waterless pot; perfect for making shabu shabu/hot pot. 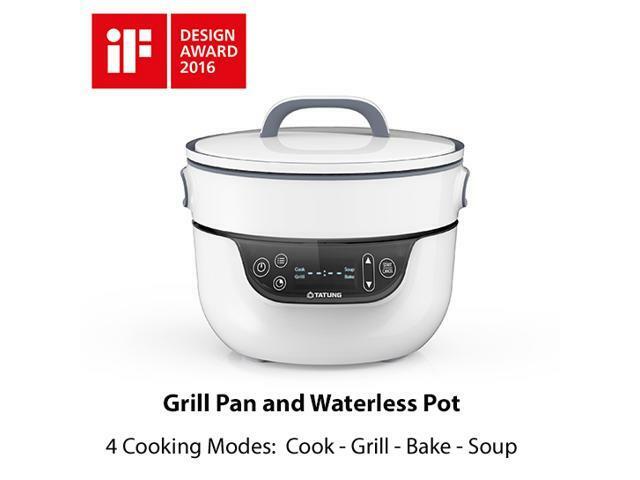 Both the pot and grill are lined with an advanced non-stick coating to prevent foods from sticking to the surfaces as they cook. 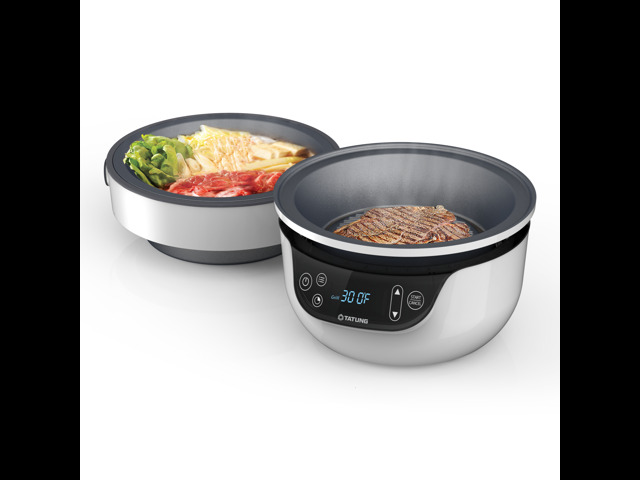 An added benefit of the Fusion Cooker is that it is energy-efficient and takes up very little counter space when in use. 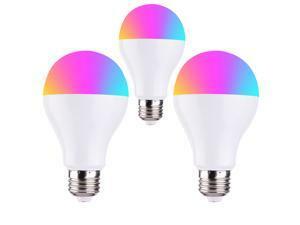 Easy user controls and built-in safety features will make it a great addition to the home kitchen.